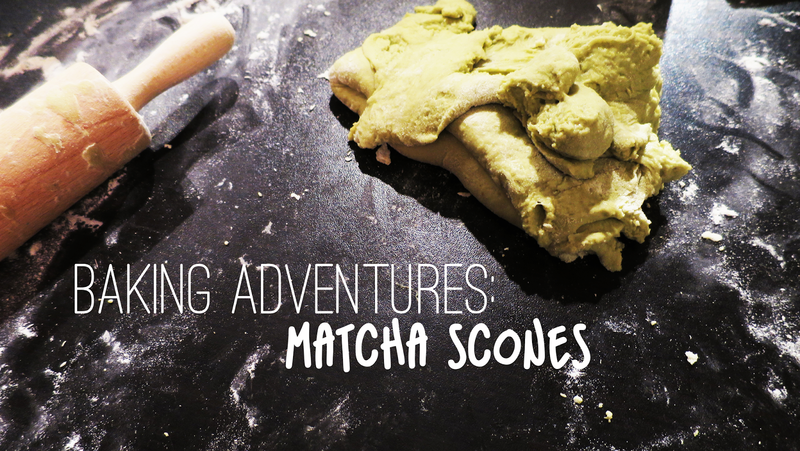 I’ve always wanted to make green tea flavoured things, I love the taste of it, and having something that is naturally coloured is always a bit of a crowd pleaser. So when my flatmate put 3 packs of matcha powder on the kitchen counter this morning upon my return from London, I was thrilled. Pinterest, of course, throws up many a pretty picture to accompany the matcha/green tea powder recipes, so picking what to bake was hard. Initially, my flatmate wanted a swiss roll style cake (pandan chiffon cake, if you will), but we didn’t have all the ingredients to hand (you can possibly expect one to turn up soon…), so we decided that scones were a better option. As you do. – using a cutter or a knife, cut out rounds (circles). I haven’t made scones by myself for a veeeeeeeeeery long time (shout out to my amazing baking dad, though), so I wasn’t too sure how these would turn out. Considering I didn’t add any extra baking powder to the mix (I might do in the future though, just for the extra rise), these scones didn’t disappoint. Although they’re definitely not bake-off standard. What do you think? They taste better and more professional than they look, I promise.